It is suitable for use in older commercial vehicles and those operating under light to medium duty conditions or in hot climates. It is also suitable for turbo-charged or naturally-aspirated engines in on- and off-highway vehicles and equipment. 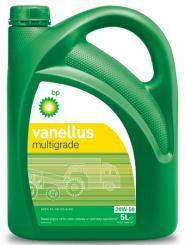 Vanellus Multigrade 20W-50 is suitable for use at standard oil drain intervals. Unbelievable price on Vanellus Multigrade 20W-50 is a diesel engine oil in Kuala Lumpur (Malaysia) company BP Asia Pacific (Malaysia), Company.